Modern furniture for kids is an important part of creating comfortable environment for children to grow, rest and play. Beautiful and functional, children furniture add fun to kids rooms and create stimulating atmosphere that every child enjoys. Children spend a lot of time in their bedrooms and playrooms, playing and leaning, resting and socializing with friends. 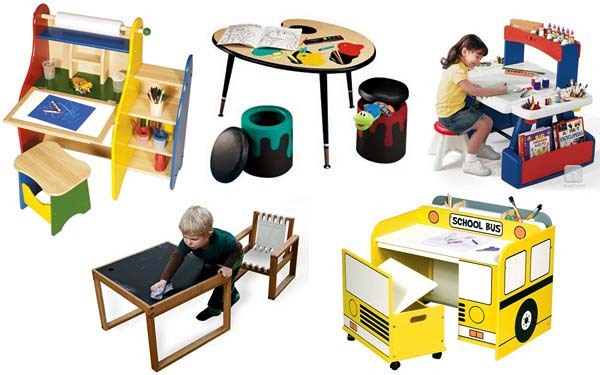 T0p 15 creative tables for kids rooms will help select the best children furniture for your home. Three tables for kids rooms, decorated with black chalk paint are great ideas. Black chalkboard tables for kids help develop creativity and talents, offering convenient large surface for artistic experiments. Even very young kids 3-5 year old enjoy drawing on a table top, creating their first graffiti. Black chalkboard table foe kids room is easy to make. Also you can use black chalk paint for other furniture decoration, creating additional surfaces for children to draw. Creative table for kids crafts and art is a bright idea. Custom made or bought art tables for kids rooms create comfortable places for enjoying coloring and drawing. Art tables for kids are perfect for young artists and designers. Colorful tables for kids look dynamic and cheerful, creating energetic mood in children bedrooms or playrooms and stimulating the imagination. 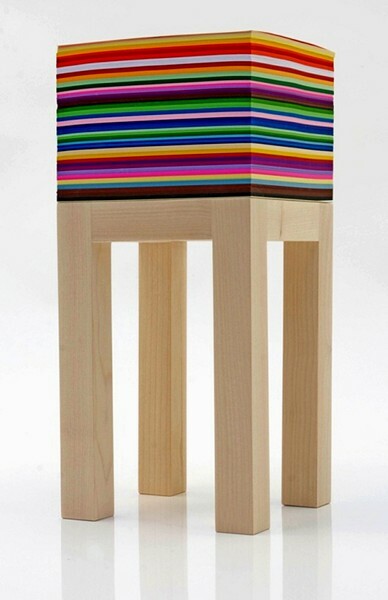 Bright patterns and colorful stripes are excellent for kids furniture decoration. Here is kids table with colorful paper top, made of large post-it notes, which are great for children bedrooms or playrooms. A child can write or draw on a colorful table top, creating a colorful collection of drawing for kids room decorating. White and pink, green and yellow, brown and orange pieces of paper with kids drawings are gorgeous kids room decorating ideas. Tables for kids rooms from Dormodinamica look simple and practical. Kids table top is made of white paper pieces, and a child can enjoy drawing and writing on a table top. 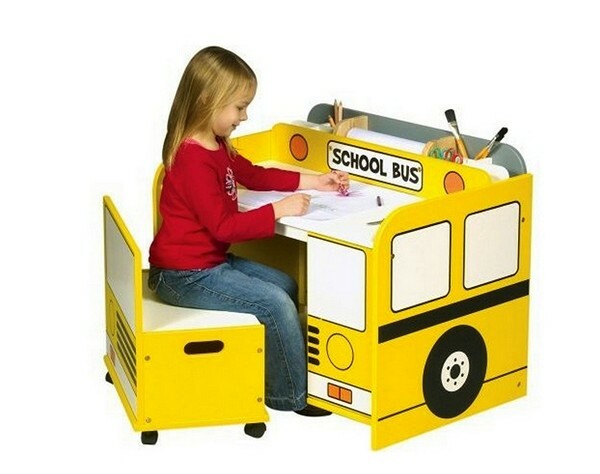 Yellow kids table School Bus Desk looks bright and cheerful, adding an adventurous flavor to modern kids rooms and playrooms designs. 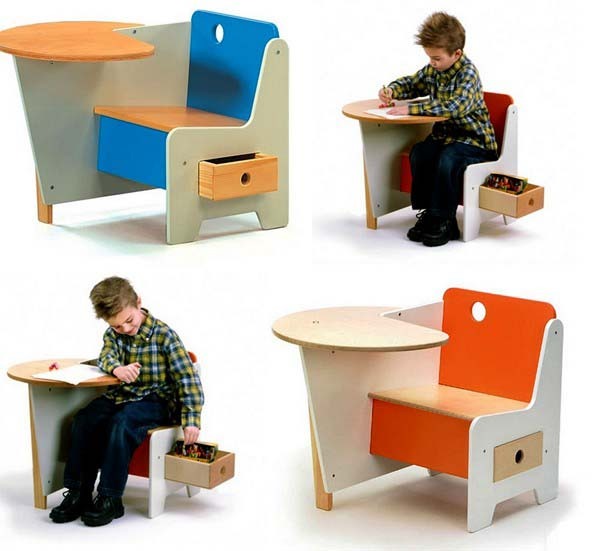 Stylish kids table and chair set from Doodle Drawer Desk collection is comfortable and organized, offering a convenient storage drawer under the seat for books, small toys and pencils. Beautifully decorated Tea Pot kids table and chairs are an excellent gift for your princess. Bright and attractive kids table and two stools, combined with toy tableware will add meaningful toys and gorgeous furniture to kids room. Animal Table from designer Quentin de Coster, Belgium is created in cooperation with young children and using their sketches for developing kids table design concepts. Wonderful kids table for crafts and art activities is designed to please all kids who dream of a pet.